One of the iconic dishes of Ligurian cuisine, just as typical of the region as pesto, the chickpea flatbread known as la farina genovese deserves to be better known. It has a wonderful, mildly nutty flavor that marries well with just about anything you want to serve it with, but it is perfectly delicious on its own, as an antipasto or snack. And it is really easy and (not counting the initial ‘rest’ for the batter) quick to make. And once you’ve mastered the basic recipe, you can dress it up in myriad ways. What’s not to like? Place the flour and salt in a large bowl, then slowly whisk in the water until you have perfectly smooth, rather thin batter, similar to a crepe batter. Let the batter rest for at least three hours or (better) overnight. When you are ready to make your farinata, mix in the oil. Now pour the batter into a greased baking sheet. It should just cover the bottom by no more than 2 or 3 cm (1/2 inch) at most, thinner if you like. Sprinkle one of more of the optional flavorings, if you like. Bake the batter in a hot oven (200C/400F) for about 15-2o minutes, or until golden brown on top. Cut into serving pieces and serve hot. The only ‘tricky’ part of making chickpea flatbread is finding the main ingredient. Chickpea flour is not that easy to find in your average supermarket, but you can find it at Whole Foods, as well as better Italian delis. And you can always order in online. The initial rest may seem like an unnecessary drag, but it really is quite important. The rest gives the chickpea flatbread a smoother texture and richer flavor. Recipes are all over the place on how long to let it rest, some calling for as little as 3 hours, others up to 18 hours. You can even let it rest longer than that: when I last made this dish, I made more batter than I needed, so I refrigerated the rest. I didn’t get around to making a second batch until a full week later—and the second farinata was even more delicious than the first. Variations on this recipe can be found in different parts of Liguria. According to Le ricette regionali italiane (Solares), farinata is made with half chickpea flour, half wheat flour in Savona. The thickness of the farinata also varies from place to place, usually 2-3 cm but in San Remo it is made much thinner. Besides the flavorings mentioned here, in the old days the farinata was made with flakes of stoccafisso, a kind of dried codfish similar to baccalà, but not salted. 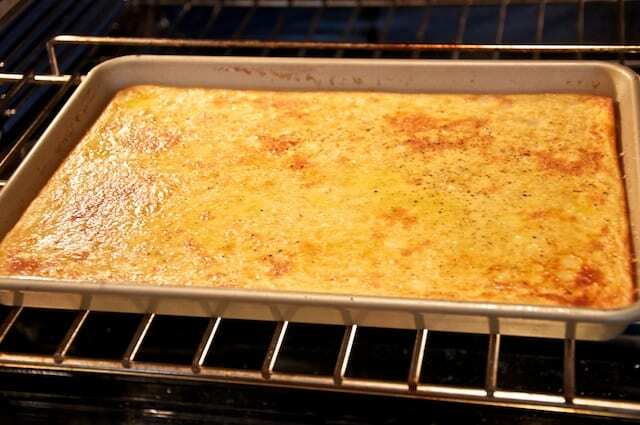 Farinata is best served hot, right out of the oven, but it will successfully reheat without much loss of flavor or texture. But don’t eat it cold, it loses most of its charm. Traditionally, la farinata is baked in a round baking dish, but if you don’t have one, it will taste just as good made in a normal rectangular dish. Those of you with Sicilian ancestry will immediately see the similarity to panelle, which uses a thicker batter (more of a wet dough, that is shaped into disks and fried. Chickpea flatbreads are made round the Mediterranean basin. with the best known one made just down the coast in Provence, where they made an almost identical dish they call socca. My fellow blogger Tasty Trix just blogged about her version of chickpea flatbread called the socca, so go check it out! Bake the batter in a hot oven (200C/400F) for about 15-20 minutes, or until golden brown on top. Cut into serving pieces and serve hot. Oh, Frank! I’m dying to make this. It looks absolutely marvelous. I’m wanting to do more with regional cooking and telling a few stories about it. I love making bread of all kinds. So much fun to sample. You do a marvelous job of explaining. Thanks so much for the kind words, Marisa Franca! Made this with some extra chickpea flour I had. I added a few spices and nutritional yeast for a more cheesy flavour. I baked it for over 40 minutes and it still didn’t seem cooked. The batter was somewhat solidified, but still really soft– almost to the point of being mush. I could scoop it out if the pan but couldn’t cut slices. Perhaps less water is needed. Nevertheless, the mushy bread tasted good. Sorry to hear it, Ron. A few guesses about what might have happened—-I’m wondering if the yeast might have altered the result? Not sure why it would, though. You might try letting the batter rest longer or pouring it out more thinly on the baking pan, or perhaps trying a bit less water next time, although these are the classic measurements for the dish. Glad at least it tasted good! Although otherwise perfect, my farinata stuck to my pan, despite a liberal oiling with olive oil. So it tastes fine, but is in ragged pieces. I was able to save even what was stuck, but I can’t serve it to guests. Will I have to resign myself to cutting a cooking paper to fit my pan? Then the bottom wouldn’t brown as well. I want to learn to make this for friends from Argentina. Many Genovesi emigrated to Argentina and Uruguay, and “faina” is a very popular dish there, often served along with pizza. Responding to my own question (for others) Yes, I did cut a cooking paper to fit my pan, and dabbed olive oil on it with a silicone pastry brush. It worked fine. I really like farinata! Great to hear it, Maria! I’ve never had the problem you describe but then, I use non-stick baking sheets. I’m sure your technique will be helpful to a lot of people, so thanks for experimenting! Just wanted to tell you that in Nice, socca is served in ragged pieces 😀 They tear the pieces off, they never cut it with a knife. Mystery to me as to why it might not have come out. An hour should *more* than enough time… My only suggestion would be to let the batter rest longer (many people leave it overnight) and perhaps look for a different brand of chickpea flour. But these are only guesses! Hi Frank just a question do I keep the batter in the fridge after I mix it for the 3 hours or overnight or can I leave it on my counter? Either way is fine, but I generally leave it out on the counter. I have made the way you told. It turned out great. I served it with borch (beet soup) tastes amazing. I have a Lodge pizza pan which is just about right for a round version of this. However, it is so shallow that the best way to use it is to grease it and put it in the oven and then, pour the batter into the pan while it is in there. Otherwise it is an impossible balancing act to get the pan with the liquid batter into the oven without spilling it. I first made farinata when a Ligurian exchange student was staying with us. He was homesick for some Ligurian cooking. This is a great base for toppings and if someone is avoiding gluten, this can be a good bread substitute too. Love your website Frank. I wish I had learned more recipes from my Italian grandmother. I found your website while searching for a farinata recipe. I have explored many of your recipes and like your website very much. My husband is from Italy and many of these dishes would be pleasing to him. Thank you for sharing your wealth of information. I will try many of the recipes and I am so happy to be able to add them to my recipe file. Your presentation is exceptional as well – I love the dishes and the granite countertop. Of course it is lunch time now, and food pictured makes me drool! I have signed up to receive your newsletter or correspondence or new recipes. I hope I have done it correctly. Thank you for this wealth of information on Italian cooking. Thanks for your wonderful comment, Diane! And welcome to the site! India markets also carry chickpea flour (besan). I must admit that I have tried to make farinata a couple of times but was not happy with the results. Your post is a good reminder that I should give it a try. The first time I ever ate farinata was in Recco along with a helping of that wonderfully cheesy focaccia for which it’s known. I make Sicilan panelle quite often, which are of course, fried. Thanks for the inspiration! I have a bag of chick pea flour in my pantry – this may very well be tomorrow’s lunch! Frank – I remember the first time I ate this I was in Portovenere and had never heard of it. They make it with a lot of black pepper. Seeing your directions and recipe brings back those memories. It seems to be in the air these days, Trix used chickpea flour to make socca pizza lately. I just threw mine out since it often happens with specialty flours, I buy it for one recipe and then it sits for a year or so and goes stale. Maybe with 2 great recipes to try I will do better! Looks yummy… would this be the same as panelle? Thanks so much for this, Frank! I’m looking forward to trying it! Frank, what a wonderful Farinata Primer! It looks beautiful, and oh so tempting, and your directions are super clear. Complimenti!